Pollycraft wanted a furry friend so I chose their stunning dave the reindeer that they gave away. Crafty Cardmakers had a sketch to follow. I would also love to thank crafty cardmarkers for getting their prize (La Pashe) last week it arrived yesterday and I'm looking forward to playing with it this week. I've been making loads of jewellery recently and I've been a bad blogger by only uploading challenge cards. I will start to try and keep it more up to date but have been posting to other website and don't seem to be able to remember to post everywhere. This card is 2 challenges in one. This is for crafty card makers as they theme is contrasting colours and I thought I would have a go after reading their tutorial and printing off one of their colour wheels. I also followed the sketch on mojoMonday. I hope people like this card. I know that it is different to see but on the left hand side I have put some little adhesive gems to the snowflakes. Paper: Red paper from the daisy and dandelion Christmas collection, green paper if from designs by krista and is the delightful set. THis is an entry that I've done for pollycraft. The challenge was favourite things. 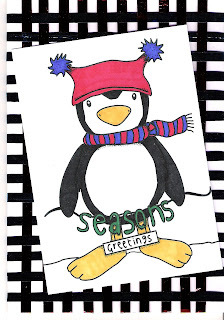 I love penguins since watching 'March of the Penguins' and I also love the colours blue and red. This penguin image is from pollycraft and the checked image is foil ribbion which is actually red and blue but has come up black. I will try and get a better picture on there tomorrow when it is better light. I know if I don't do it now I will forget. This is a challenge from Allissa Designs (the link is on my side bar). 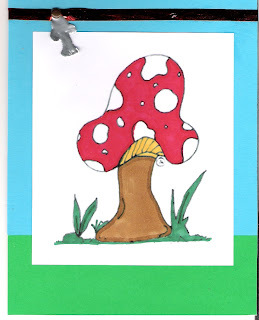 She asked you to create a card with her shroom image. It must include red, mustard, brown and green. It must also have a piece of ribbon and a charm. I used foil ribbon in red as I find it gives a nice shine. I didn't have any charms so I didn't know what to do then I thought about I had been shown how to make them at a demo, so I made a charm of a mushroom to match it. Here's my entry for moving along with the times. I think that I have left it too late but we'll see. Here's my latest make that I made at the make 'n' take. This is my first attempt at wirework so the wire is not as neat as it could be but I'm learning. I know how to improve this for next time. I was bored last night and decided to do some crafting. I made my first ever card with an elegant lady. I love the colours of the background. I loved making the pyramage card as it looks great but is really simple when you can line up the parts. These are my latest creations. 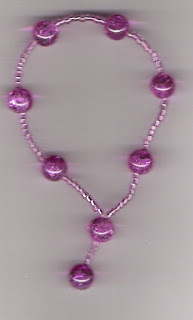 I made them on Thursday at Bunyip Beads at the make n take session they run every month. It's was great as when I need help there is someone there that can show me. I made the pink one first and then the green one. These are the latest ATC's I've made. The teddy bears were for a craft beautiful swap, and the bunny is for the ATC draw also on craft beautiful. I kept the tessy bear with a balloon, as I like to keep one of every set I complete. 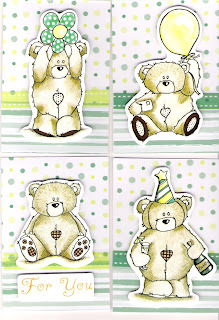 This is a picure of my first ATC's. I did the swap on the crafts beautiful forum and have kept one for myself. I know that they are not the best, so if you have any comments on how I can improve feel free. This is my first dealing with paper craft that has been given to someone else. I got the paper and the toppers from Allissa Designs who gave these for free for Easter. Her link is on the side bar. This is the latest make of today. I spent all evening making it but love the outcome. I know that if I was to do this one again I would have to work on finishing it off. I may need an extra 5 pairs of hands to help hold on to different bits. I love the colours of this necklace and the fact that it's different to all other necklaces I own and have seen in the shops. This is my latest necklace that I've made it didn't take long to complete and I really like it. I've enter this in the jewellery challenge. 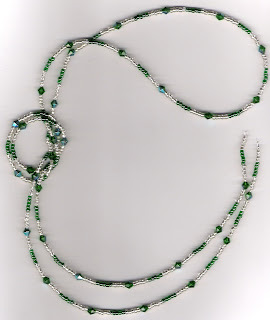 I've had all these beads for ages now and didn't know what to do with the green beads. This is my first lariat that I've made and I want to make more in the future. I haven't been brave enough to wear it yet as it's completely different to anything I've ever bought - not that I've ever seen one on the high street. Here are some of my jewellery I have made with a crafting challenge in mind. This is the bracelet I made for the jewellery challenge that tiggertastic runs. I am going to try and put a link at the side if I can work it out. I found this bracelet a pain to do as when I was trying to knot the elastic I kept flicking sead beads off in all directions. This is the 2 makes I made for the Create with Kate on the crafts beautiful forum. This was interesting to do as both bracelet and necklace I learnt a lot. I now can just about manage to knot elastic and finish it of better. I also made my first cluster necklace. The bracelet looks much better wearing it then on the scanner. The cluster necklace also does not sit properly on the scanner. At some point I need to buy a decent camera so that I can get good photos. Here is picture of all my first makes. I wanted to start this blog so I can see all my pictures in one place. 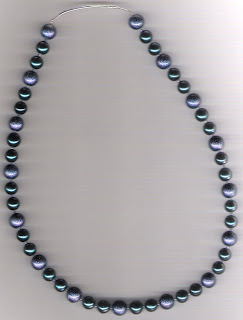 This is my first necklace I ever made after I went to the gem 'n' beads fair at newton abbott racecourse. I made this by following instructions in a book. This was really easy to make and turned out well. 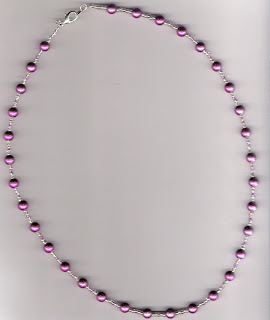 My second necklace is this double standed one. 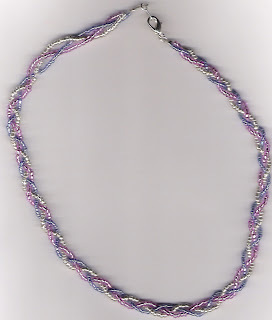 I had flicked through the book and saw it talking about double standed necklace and decided to do something different. This worked out well at the time. It is not my favourite and one of the beads has broken, the quality was not great seen lots of cracks in the other ones now. My 3rd one I made was from the LGC magazine and I picked it up so that I could get some new ideas. I copied one of the designs in their and actually made my first set of earrings to go with it.